The colonial city of León provides Christian and Nora with all the amenities they want. Hailing from Quebec, Canada, Christian is a pretty high energy guy even at age 53. Christian began work as a registered nurse, transferring his skillset to Fort Lauderdale, Florida, where he managed three critical care facilities. In his spare time, he was buying houses, renovating them and reselling. This was how he met Nora Lola, a real estate agent who partnered with him on property deals. Soon after they became life partners as well. But one thing is a given when living in Fort Lauderdale, and that’s the reality that oceanfront property is pretty darn expensive and well out of the reach of all but the very rich. So, when Nora came across a listing for a property in Nicaragua, which included beachfront on the Pacific, flanked by the Rio Chiquito estuary, they had to go look. Look they did, at a totally undeveloped property with the waterline at its edge, and unparalleled natural beauty. It was love at first sight. As a bonus, León was close by and offered a place to live with all the amenities they wanted. Decisions were made, some properties were sold, and funds were raised. “No risk, no reward” became their motto. Fast forward three years to the present, and you’ll see a well-groomed property with a snack/beverage bar, a covered sitting area with games tables, a pool, water sports facilities, bicycles, tables and umbrellas, hammocks, and the list goes on. Currently a couple of small casitas are being built for overnight stays. They’re creation is called Salinas Grandes Day Beach Resort, and it’s become the perfect engine for funding a more rewarding life overseas. 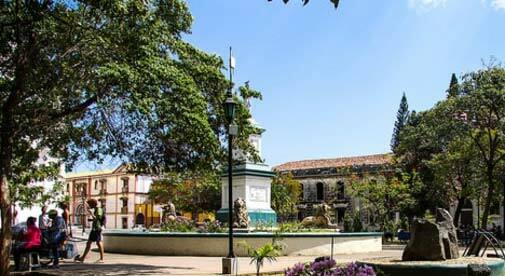 León is an old colonial city but also a university town, with lots of young people and a vitality of its own. “We bought a small house in a gated community for about a third of the price I would have paid in Florida” says Christian. “You can rent a nice place for around $500 per month or go Nica-style for around $200. My water bill is less than $5 per month; in Florida it’s about $80 when I’m not home. “You can get a meal and drinks at a good restaurant for about $30 per couple. In Florida that would cost about $60 at a sports bar. Car insurance is about $400 per year, as compared to $1,200 in Florida for an older vehicle. The only things you will find more expensive are imported luxury items and some construction materials; I found that out from experience,” says Christian.